Ivybridge was built up on the borders of four parishes, Cornwood, Ermington, Harford and Ugborough, whose boundaries all met the old Ivy Bridge. It is therefore unsurprising to find parish stones sited by the bridge. There are two parish boundary stones, one inscribed Ugborough located on Harford Road and one inscribed Ermington, on the other side of the river, on Erme Road. This semi-pyramidal topped cast iron milepost marker was one of 15 posts that were positioned on the old Plymouth to Exeter road in the 1820s, by the then Plymouth Eastern Turnpike Trust. Turnpike Trusts were private companies created under an Act of Parliament and were responsible for the condition of the roads. In return they were able to levy a toll for people to use the roads and toll gates were established through which the carriages had to pass before continuing their journey. In Ivybridge, there was a toll house at the bottom of Cole Lane. The money raised was split between the shareholders and the cost of maintaining the roads. County Councils eventually took over the responsibility for the maintenance of the roads within their boundaries towards the end of the nineteenth Century. There are just four known surviving mileposts on this route. They are located at The Ridgeway in Plympton ( marking 5 miles to and from Plymouth), on Exeter Road in Ivybridge ( marking 11 miles ) at Bittaford ( marking 13 miles ) and at Wrangaton Cross ( marking 14 miles ). Although Turnpike Trusts were responsible for stretches of road, the County Councils were generally still responsible for maintaining the bridges and the short stretches of road on either side. County Bridge Stones, engraved with the letter ‘C’ mark the limit of the roads for which the County Councils were responsible on each side of a bridge. 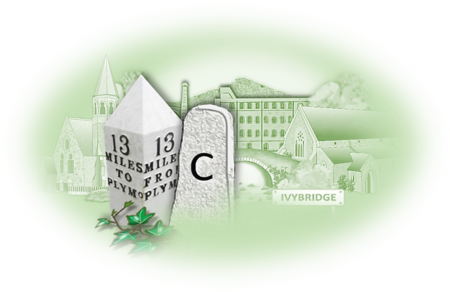 Ivybridge has two County Stones inscribed with a letter ‘C‘. One is set into the wall in Erme Road whilst the other is set into the wall of the car park opposite Costly Street. Ivybridge was built up on the borders of four parishes, Cornwood, Ermington, Harford and Ugborough, whose boundaries all met the old Ivy Bridge. It is therefore unsurprising to find parish stones sited by the bridge. There are two parish boundary stones, one inscribed Ugborough located on Harford Road and one inscribed Ermington, on the other side of the river, on Erme Road. There are just four known surviving mileposts on this route. They are located at The Ridgeway in Plympton (marking 5 miles to and from Plymouth), on Exeter Road in Ivybridge (marking 11 miles) at Bittaford (marking 13 miles) and at Wrangaton Cross (marking 14 miles).